The operational future of the South African Navy (SA Navy) is in question as it struggles against an internal enemy: how to fulfil its constitutional mandate in an era of declining budget allocations. Bringing together senior government, military and maritime defence industry players, the conference attendees discussed the protection and promotion of South Africa’s maritime and related assets. This cannot happen without maritime security she said, saying that “this is the role of the South African Navy, responsible for maritime defence. The SA Navy, in cooperation with the South African Air Force, has been involved in anti-piracy patrols in the Mozambican Channel under Operation Copper since the SAS Mendi commenced patrols in 2011. The SA Navy also conducts maritime border safeguarding operations under Operation Corona. However, with a budget allocation of R4.4 billion this financial year, the SA Navy is facing a crisis like no other in its 96 year history. 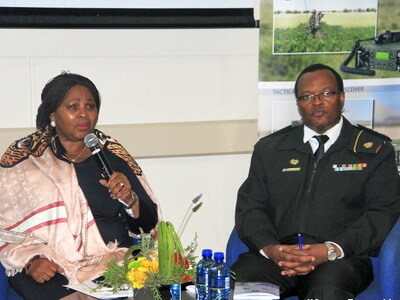 Describing the geo-strategic and geo-political world and the effects of this on South Africa and the Navy, Hlongwane echoed what Mapisa-Nqakula stated during her budget speech of 18 May 2018, where she said that “the unpredictability of the strategic environment, together with emerging conflict trends on the African continent, requires us to maintain a credible military force as a deterrent,” and that that terrorism posed a real danger to the southern African region. In this year alone, the defence budget experienced a reduction of R5.8 billion, posing serious constraints to defence and the plan to address the decline remains unfunded. The reality of years of budget constraints and declines has had a major impact on the operations of the SA Navy, notwithstanding the latest Defence Review and the requirement to arrest the decline in the South African National Defence Force (SANDF) capabilities. Mapisa-Nqakula does appreciate the challenges faced by the national fiscus, but believes that if they want to talk about growth and economic stability, “we need to spend more on securing the country, so that investors can feel confident that, indeed, you can invest in South Africa,” she said. However, that there are certain areas which can still be “tightened up”, such as command and control within the Defence Force and issues of discipline.